Shashwati Shradha is serving as a Software Engineer intern this summer at Raven Applied Technology. She is heading into her third year as a Computer Science and Math student at South Dakota School of Mines & Technology. 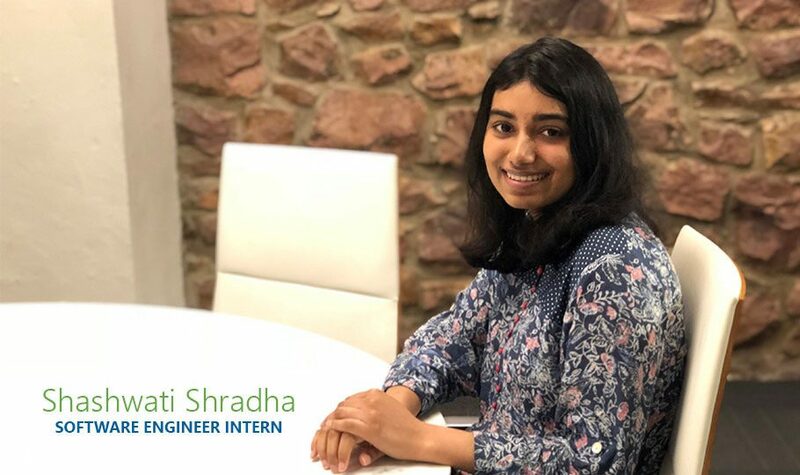 Working together with her mentor, Shashwati is designing enhancements to the universal terminal on the CR7™ field computers that Raven Applied Technology makes. Specifically, she is working on adding the auxiliary controls. This will make it easier for farmers to operate multiple devices from a single terminal. Meeting her fellow interns, peers and mentors at Raven has excited Shashwati for the rest of her summer. Her mentor, David Rislov, Senior Software Engineer for Raven Applied Technology, has inspired her with his knowledge on the projects they undertake, his calm attitude and approachable nature — a great display of Raven Values. Shashwati says the Raven Values of Service and Humility both resonate with what she has experienced at Raven thus far. “We are helping the farmers get the maximum profit and make their work easier with the projects we undertake,” Shashwati says of Service. She also sees Humility in the way interns learn from their mentors and peers. Raven's purpose to solve great challenges is at the core of Shashwati’s internship work. As the population is increasing, the demand for food is increasing. The mass production of food with maximum production has been challenging over the years. Using technology in agriculture will increase the efficiency, hence solving a great challenge. Shashwati appreciates the variety of projects and depth of involvement offered to interns. She would encourage future interns to ask for help and get to know people along the way to make the most of their experience. After graduation, she hopes to continue her involvement in the software industry as well as her education.